We live in a water-scarce area, and forces outside of our control can threaten our local water resources, including lakes, rivers and beaches. LA County residents rely heavily on imported water from the Sierra Mountains, the Central Valley and even from states as far away as Colorado. Climate change is causing more and more extreme weather conditions, making these remote sources more unreliable . The impacts of the recent five-year drought were widely felt here. 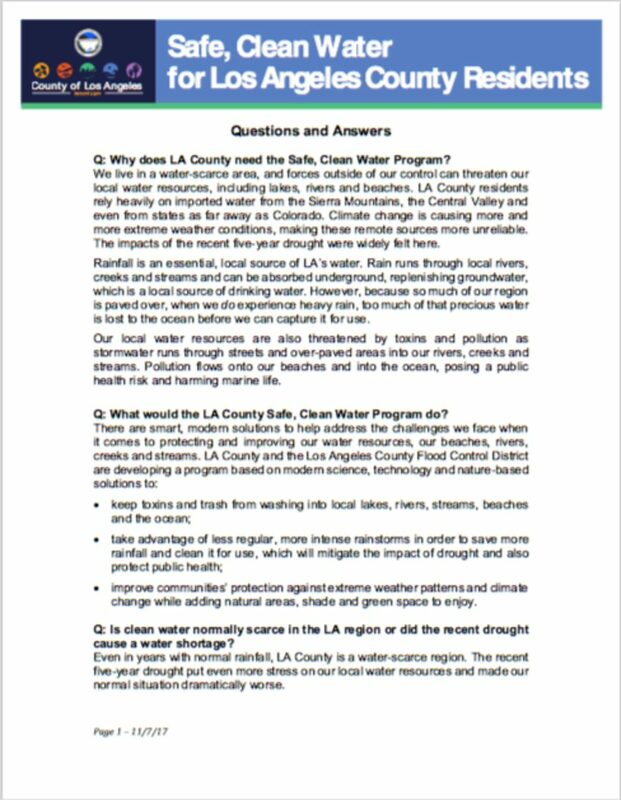 Rainfall is an essential, local source of LA’s water . Rain runs through local rivers, creeks and streams and can be absorbed underground, replenishing groundwater, which is a local source of drinking water. However, because so much of our region is paved over, when we do experience heavy rain, too much of that precious water is lost to the ocean before we can capture it for use. 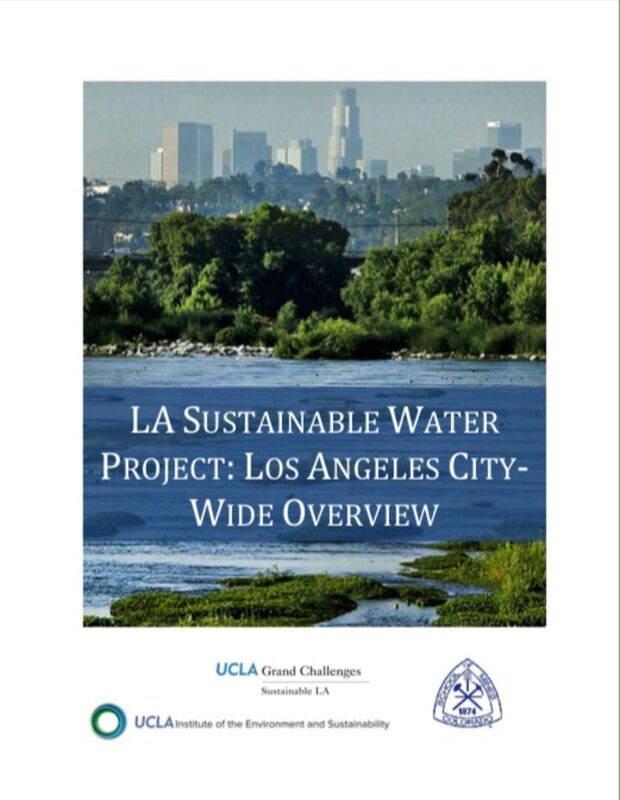 In June 2013, the Board adopted a motion requesting collaborative participation with the County Sanitation Districts of Los Angeles County (LACSD) and other wastewater management agencies to evaluate methods, assess the a potential model governance structure, and to help identify and secure other sources of funding. In response to the Board’s actions, the City Managers Committees of the California Contract Cities Association (CCCA) and the League of California Cities, Los Angeles County Division (League) convened a City Managers meeting with representatives from public schools, environmental organizations, and the business community on June 27, 2013 to hear stakeholders’ concerns and suggestions directly. 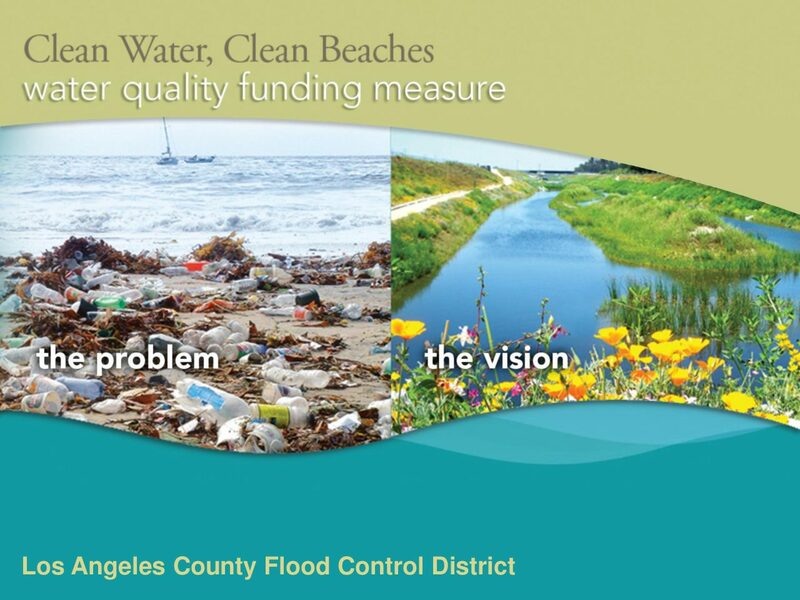 The City Managers attending the meeting authorized a Work Group to review stormwater funding options after the County’s proposed Clean Water, Clean Beaches funding initiative failed to move forward. The City Managers Work Group actively sought the input of key stakeholders from the environmental, public education, and business communities, and prepared this report to assist the Board, local decision makers, stakeholders, and the public in reaching a common understanding of the issues at hand and the potential solutions. The Managers found that to fully understand the issues, improved communication and education is necessary. 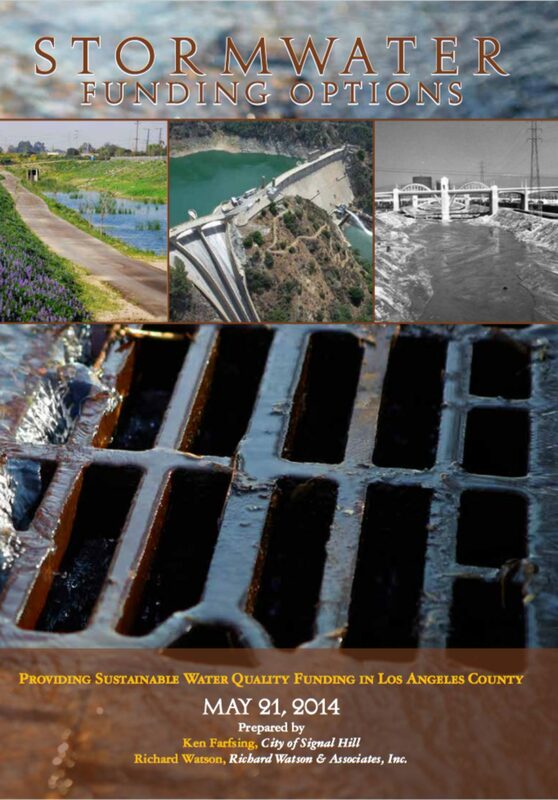 This report describes the stormwater regulatory requirements speci c to the greater Los Angeles area, the complexities of funding stormwater programs, and the LACFCD’s funding initiative. It examines the regulatory framework for stormwater management, including the requirements of the National Pollution Discharge Elimination System (NPDES) MS4 permit (stormwater permit) and the total maximum daily load (TMDL) programs. The report also summarizes the impacts of the federal TMDL Consent Decree for the Los Angeles Region signed in 1999, which has indirectly regulated the LACFCD, 85 cities, and the unincorporated County since that time. Further, it reviews estimated stormwater program compliance costs, the “pros and cons” of various funding options, and evolving opportunities. The report concludes with a series of recommendations agreed upon by the City Managers. Suggestions from an Elected Officials Committee and individual City Attorneys are also included in this report. The Work Group found that funding urban runoff programs is so complex and dynamic, and the solutions so costly, that the County and the Cities cannot follow a single funding strategy at this time. One option, for example, is to examine institutional roles to determine whether other agencies, such as the County Sanitation Districts, either provide a useful governance model or could play a new or different role in managing stormwater in the future. During the report development process, the Sixth Appellate Court clarified the application of Proposition 218 regarding the imposition of fees for the capture and use of stormwater for groundwater recharge (Griffith v. Pajaro Water Management Agency). This ruling could have major implications on funding options. These are only two examples of the changing nature and complexities in charting a path forward. The City Managers Work Group recommends a “multi-pronged” approach to address urban runoff funding issues, since our communities may encounter several dead-ends. A number of the recommendations require active management and a higher degree of organization by local government. The recommended actions are voluntary. The report is not advocating that any city, group of cities, or the County adopt stormwater fees. The managers are committed to local control; if a regional fee moves forward, each community should make its own decision whether or not to participate in the regional effort. However, there are steps that local governments can take that will assist in funding the new stormwater mandates. For example, cities should organize and be active in the water bond discussions. This report suggests a voluntary framework through Contract Cities and the League to organize those communities that desire to engage in implementing the recommendations found in this report. It should be noted that the recommendations involving California Contract Cities, the Los Angeles County Division of the League of California Cities, and the State League of Cities have not been of cially endorsed by these organizations at this stage of the process. The City Managers Work Group and the Elected Of cials Committee held detailed discussions with staff from both organizations in order to re ect their input and concerns. Recommendations involving these organizations, such as changes in State legislation, would need to be reviewed and approved by each organization. Stormwater runoff is a leading contributor to water pollution in urban and developing areas in the United States. Section 438 of the Energy Independence and Security Act of 2007 (EISA) requires agencies to protect water resources by reducing stormwater runoff from any federal development projects. 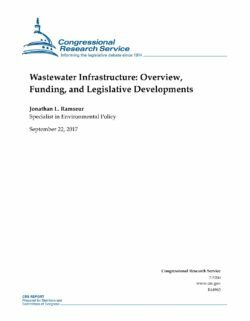 The intent of Section 438 of the Energy Independence and Security Act of 2007 (EISA) is to require federal agencies to develop and redevelop applicable facilities in a manner that maintains or restores stormwater runoff to the maximum extent technically feasible. Until recently, stormwater programs established to address water quality objectives have been designed to control traditional pollutants that are commonly associated with municipal and industrial discharges, e.g., nutrients, sediment, and metals. Increases in runoff volume and peak discharge rates have been regulated through state and local flood control programs. Although these programs have merit, knowledge accumulated during the past 20 years has led stormwater experts to the conclusion that conventional approaches to control runoff are not fully adequate to protect the nation’s water resources (National Research Council, 2008). 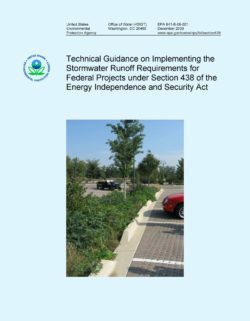 Implementation of Section 438 of the EISA can be achieved through the use of the green infrastructure/low impact development (GI/LID) infrastructure tools described in this guidance. The intention of the statute is to maintain or restore the pre-development site hydrology during the development or redevelopment process. To be more specific, this requirement is intended to ensure that receiving waters are not negatively impacted by changes in runoff temperature, volumes, durations and rates resulting from federal projects. It should also be noted that a performance-based approach was selected in lieu of a prescriptive requirement in order to provide site designers maximum flexibility in selecting control practices appropriate for the site. This document represents one of the items set forth in the Water Resilience Work Plan presented to the Board of Supervisors in June 2016. The Rapid Assessment presents some of the early findings of the research to identify the most promising approaches and related financial need. 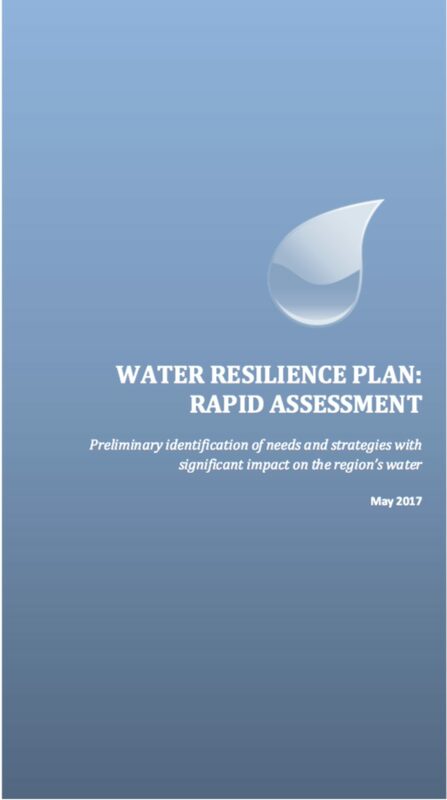 As a piece of the larger Water Resilience Plan, a first draft of which Public Works plans to present to the Board in summer 2017, the Rapid Assessment provides a targeted snapshot of the research outcomes and underscores the greatest perceived needs relevant to building regional water resilience. The context of climate change and unpredictable rainfall in Southern California has greatly diminished the reliability of imported water supplies and our ability to replenish groundwater in recent years. This new reality calls for practical, effective strategies to access significant amounts of locally available water to supplement and build resilience in the region’s water supply . Currently, the County of Los Angeles manages to capture and store enough stormwater to meet the demand of one and a half million residents each year. Research has shown that implementation of a portfolio of regional stormwater capture projects could increase this amount between two- and three-fold by ensuring the region can capitalize on less regular, more intense rain events. 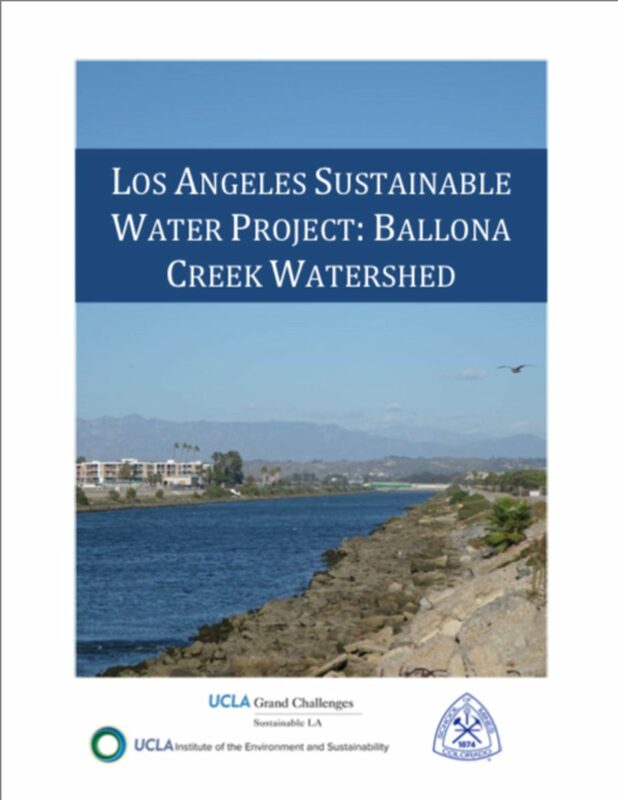 While other sustainable sources of water should be considered and integrated into a comprehe nsive water management strategy for the region, stormwater represents an accessible, abundant resource with limited funding opportunities. Potable and recycled water are underwritten by ratepayer revenue that also supports improvement and expansion of related infrastructure. Available funding for existing stormwater capture supports current County operations and maintenance, but is insufficient for any significant expansion. Desalination has limited dedicated funding , but relies on costly treatment options that have unclear environmental impacts for the region. 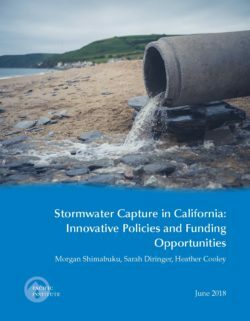 Significant investment in regional stormwater capture projects would have substantial impact on local water supply while contributing to improvements in overall watershed health. Stormwater capture strategies, in particular, provide unparalleled opportunities to improve water quality and enhance communities through the integration of multi-benefit approaches. New funding opportunities will be necessary to facilitate the design, implementation, and operations of centralized projects with regional benefits.